Just a little over a year ago in the Archdiocese of Chicago, we merged the Evangelization Office with the Office for Mission Education and Animation. We took this action because it made good theological sense. We also wanted to correct the erroneous view by which “mission” is understood solely in terms of “foreign mission,” and we wanted people to understand that evangelization is a vital ministry for us to carry out right here in the United States. Many people, at least in our archdiocese, did not see the inherent relationship that exists between evangelization and mission. With the news that there would be a Synod on the New Evangelization, we felt we needed to make a response to this call and provide some form of formation for the parishes of the archdiocese. Hence, the formation process, Becoming Missionary Disciples was born. Responding to Christ: Conversion and ongoing conversion as the call to growth. Five types of conversion and their implications for changing our hearts and minds. Encountering Christ in the Scriptures: Deeper Ways to Pray. Work with the story of the Samaritan Woman to help people open themselves to deeper intimacy with the Lord. Deeper Prayer – Lectio Divina, Guided Meditation, Centering Prayer, etc. Helps for Growing in Christ: Our liturgical life and how ritual works. Explore how ritual works and the primary symbols of our Catholic liturgical life. The process of growth as we encounter Christ in Word and Sacrament. Mission Education: Rediscovering our missionary identity and living our faith in the public square. Discovering what the documents of the Church teach us about mission. Being Sent: The witness of our lives is meant to attract others to life in the Church. Getting acquainted with tools that can help us see ourselves more clearly. The Cycle of Mission Praxis: This tool enables people to apply a theology of mission in various contexts. It gives people a concrete tool that can be used by groups concerned about mission and the new evangelization. The aim of the process is to help parishioners realize their baptismal call to participate in God’s mission in the world. In this process, we seek to provide input for informing and forming people to ably develop their missionary identity. Our hope is that Catholics will see themselves as being on mission wherever they are. Since everything in our archdiocese is done in English, Spanish, and Polish, we worked with three teams of presenters and three editors of the material. Soon we hope to have DVD’s and workbooks ready for the formation sessions for mission coordinators in each parish. Our conviction is that if we are to be an evangelizing people we need to have a deep understanding of and commitment to sharing in Christ’s mission. 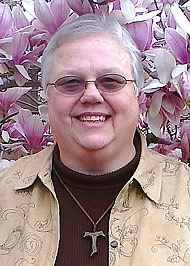 Sr. Madge Karecki is the Director of the Office for Mission Education and Animation in the Archdiocese of Chicago. She has degrees in theology and missiology from Loyola University Chicago, St. Bonaventure University, and the University of South Africa, where she obtained her doctorate in missiology. Sr. Karecki has published three study texts (Patterns of Mission Praxis, Intercultural Communication of the Gospel, and Dynamics of Interreligious Encounter) as well as numerous journal articles. Currently she serves on the Boards of From Mission to Mission, the US Catholic Mission Association, and the Pontifical Mission Societies in the Americas.